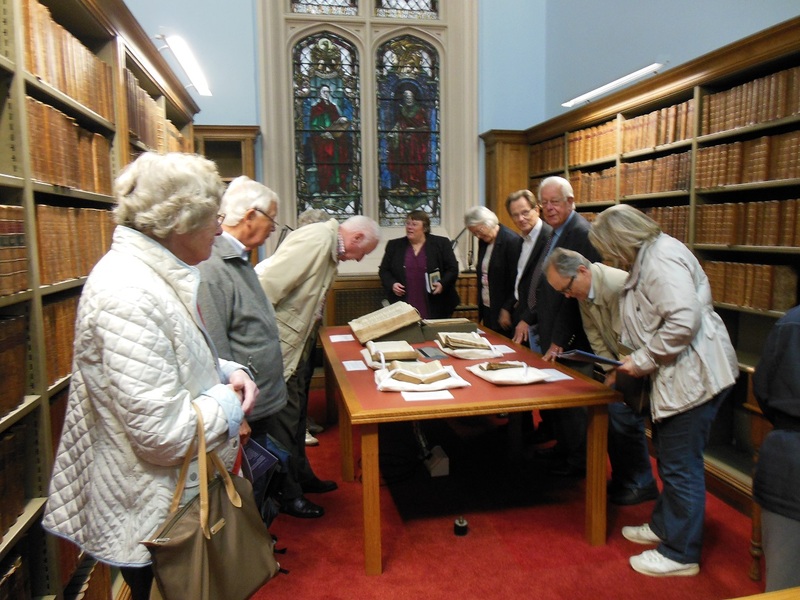 We were pleased to host a recent visit from the Friends of the Reformation Museum in Geneva at New College Library. The Friends were delighted to be able to view a selection of treasures from the Library’s Special Collections in the Funk Reading Room. These included Andrew Melville’s Bible, an early Greek New Testament, a Bassandyne Bible and a Geneva Bible. Their packed programme for the rest of the day included singing a psalm from the Wode Psalter in Greyfriar’s Kirk. 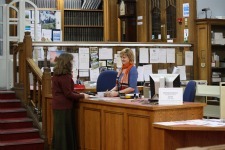 Welcome to arriving students at New College Library! A big welcome to all our new students arriving today. New College Library holds over 250,000 volumes, including rich and unique Special Collections, making it one of the leading theological libraries in Britain. In addition to the books there are online collections – electronic journals, electronic books and databases which the University subscribes to support your studies and research. As the Academic Support Librarian, my role is to help students get the most out of using the Library. Freshers Week is a good opportunity to take a little time to get to know the Library – do this now and you’ll be paid back later on in your studies. From next week the Library is open 9am-6pm-10 Mon-Thurs, 9am-5pm Fridays, 12noon – 5pm on Saturdays. Remember that you can also use the Main Library which is open longer at weekends. I’m running Library Tours on Wednesday 11th for postgraduate students and on 17, 22 and 24 September at 1.15pm for undergraduates – and anyone else who would like a tour. 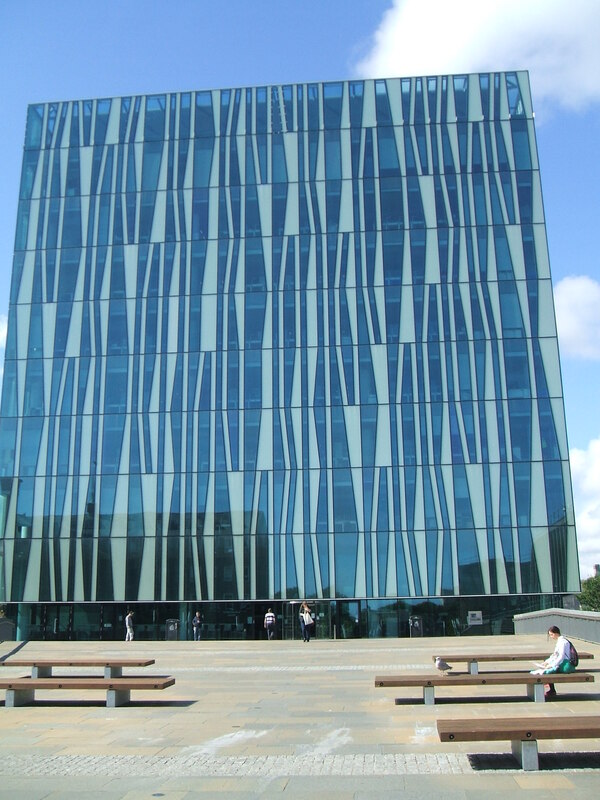 Last week I was privileged to attend the CILIP Rare Books and Special Collections conference at the Sir Duncan Rice Library at Aberdeen University. I was able to take a poster about the Funk Donation Projects at New College Library, which fitted well with the theme of buildings and refurbishment projects for Special Collections. I began the conference with a visit I’d arranged to Christ’s College Library, Aberdeen, thanks to the College Administrator, a New College alumnus. In the course of the Centre for World Christianity Library project that I’ve been working on over the summer, I’ve come across a number of books marked Christ’s College Library Aberdeen, so I was keen to see this Divinity library. 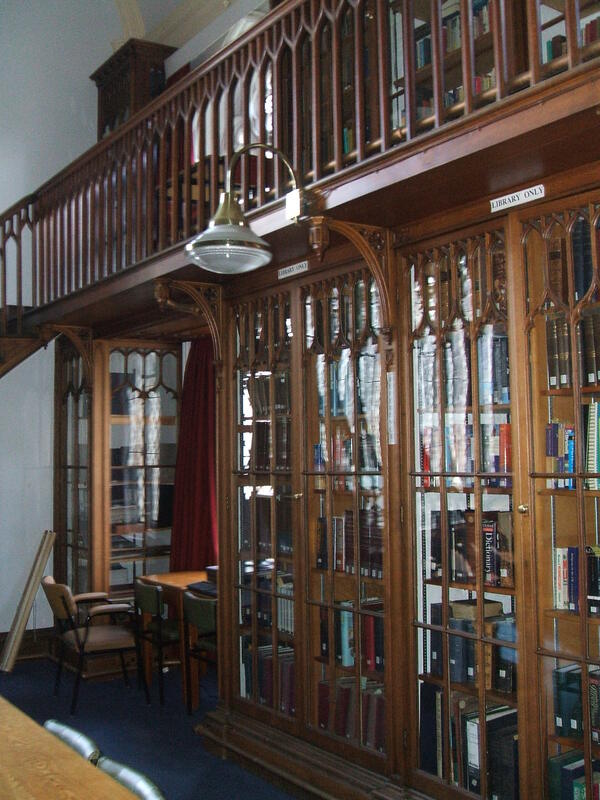 The last remaining departmental Library at the University of Aberdeen, it’s supported by the Church of Scotland to provide books for undergraduate students of Divinity. The beautiful nineteenth century library environment also provides a setting for seminars and events for Christ’s College, which has a historic role overseeing the preparation and support of candidates for the ministry of the Church of Scotland. Recently it has developed a new Centre for Ministry Studies. I took the opportunity to visit Kings College Chapel, where I realized that the war memorial stained glass window was designed by Sir Douglas Strachan, who designed the windows in the Free High Kirk building which is now New College Library. 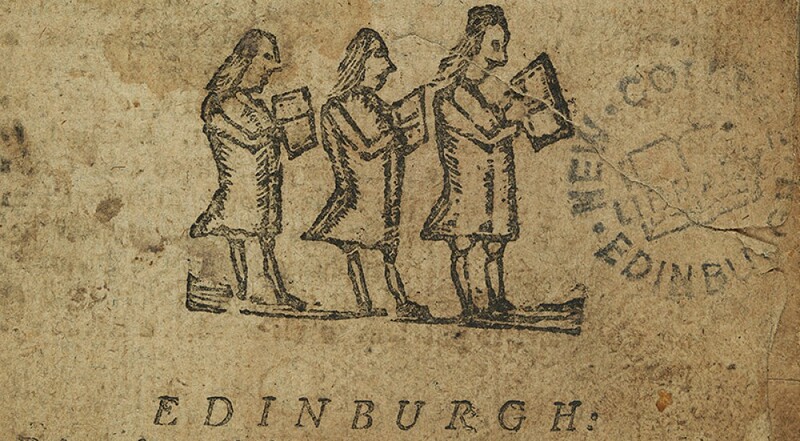 I had learned before coming to the University of Aberdeen about their Pamphlets collection, which has a relationship with the newly catalogued Pamphlets Collection at New College, Edinburgh. 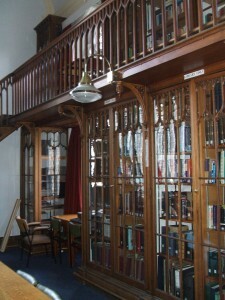 Following the Union of the United Presbyterian Church with the Free Church of Scotland in 1900, the United Presbyterian College Library was dispersed among the three Free Church Colleges (including New College), and the pamphlet volumes were part of the collection that came to the Free Church College in Aberdeen (now Christ’s College). 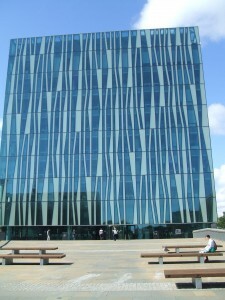 The older part of Christ’s College Library was deposited in Aberdeen University Library in 1986. A tour of the newly built Sir Duncan Rice Library showed the importance of donor support for the Library project, with every area and room of the library named after a donor or supporter. I met Mrs Janet MacKay, Information Consultant for Divinity, History and Philosophy in the Elsevier Information Consultants Room for a helpful chat about the similarities and differences in our roles. I’d been struck by the Subject Information point desks on each floor of the Sir Duncan Rice Library, and also by the balance of bookstock vs study spaces / PCs in this library. Shared themes were supporting PhD students and the continued importance of the printed book to Divinity.